Whether you're considering a new network or upgrading an existing one, our certified staff can evaluate your needs and help you make the right network, software or hardware decision. You can request a high level assessment of your network at no charge. The basis of a stable network is good design. 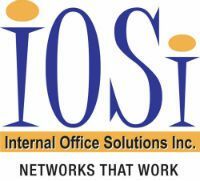 IOSi believes in providing our clients with a solid infrastructure that will provide a stable environment for your users. A proper design will takes a number of factors into account. This includes quality infrastructure, available resources and the most important factor of all – the users' requirements. Security is a growing concern for most companies. The increase in malicious attacks has forced business and organizations of all sizes to take serious measures to protect their data and other intellectual property. With heavier dependence on web-enabled applications and tools, the threat will continue to grow. Even a small office with a single remote user requirement is at risk. Our goal at IOSi is promote your productivity, while at the same time ensuring that your network is protected against all threats, including viruses, hackers and data loss. In the end the question has to be, how much is your data worth? IOSi is certified by WatchGuard at the “Expert Level” in the WatchGuard Secure Partner Program (WSPP). We offer secure solutions for Enterprise Class organizations to small and home offices (SOHO) with fewer than ten people. IOSi is proud to be the first WatchGuard Certified Training Partner (WCTP) in Canada. Monthly training courses allow our clients the capability of supporting their Firebox in-house. VPN's are primarily services of convenience. They allow companies to leverage existing infrastructure for mobile and remote users as well as remote offices. Instead of setting up a separate network for a small branch office with its own support requirements, a company can simply provide an Internet connection and a computer that connects to the home or remote office and all its services. VPN's are the perfect solution for road warriors and executives who need reliable access to the network and all its services. This includes email, calendaring, data and intranet access, and secure communications. WatchGuard Mobile User VPN uses IP Sec with DES or 3DES-CBC to encrypt incoming traffic, and MD5 or SHA-1 to authenticate data packets. The Network Administrator creates and distributes a security policy configuration, along with the Mobile User VPN software, to each telecommuter. Once the software is installed on the telecommuter's computer, they can securely access corporate resources. Do You Need Managed Security? Protect Your Business Assets by Outsourcing . If you manage IT in a medium to enterprise-sized business, your resources and budget may often be stretched to their limits. Your security needs are critical, but you need to put a security solution in place that is easy to manage and cost-effective. One way to achieve this is to outsource your security to a managed security provider. Is your in-house level of security expertise limited? If you lack staff with network security experience, outsourcing gives you the immediate benefit of high-level expertise in defining and implementing a security policy that fits your needs. Is it critical that your network security be monitored 24/7? If continuous network security monitoring and management is crucial to your business, outsourcing may be the most cost-effective method. Do you want additional security services? IOSi offers quality managed security that can provide a key outsourcing benefit: access to a wide range of services, such as regular security reviews, automatic software updates, and detailed analysis and reporting.